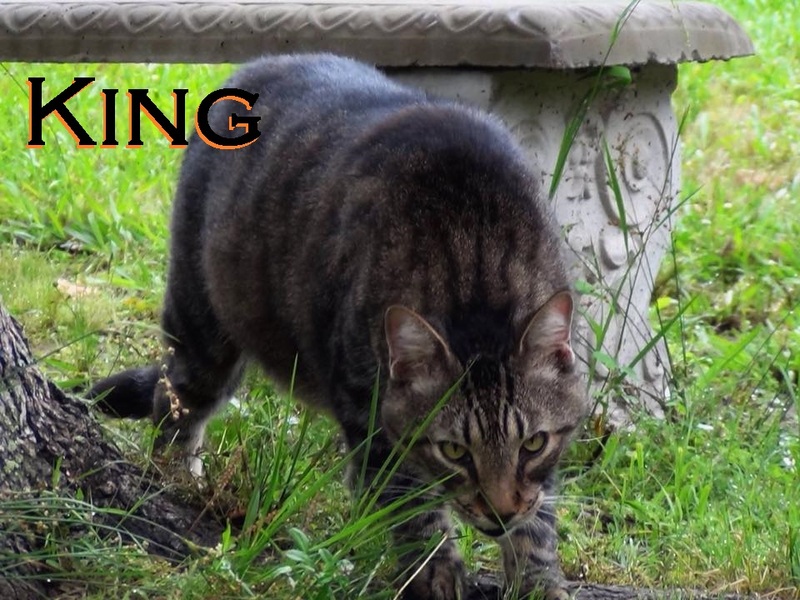 Support a Special Needs Cat: FIV (Feline Immunodeficiency Virus) is a feline only, virus. It is so slow to progress that most FIV+ cats die of old age. Once thought to be deadly and highly contagious, it has since been found to be neither. 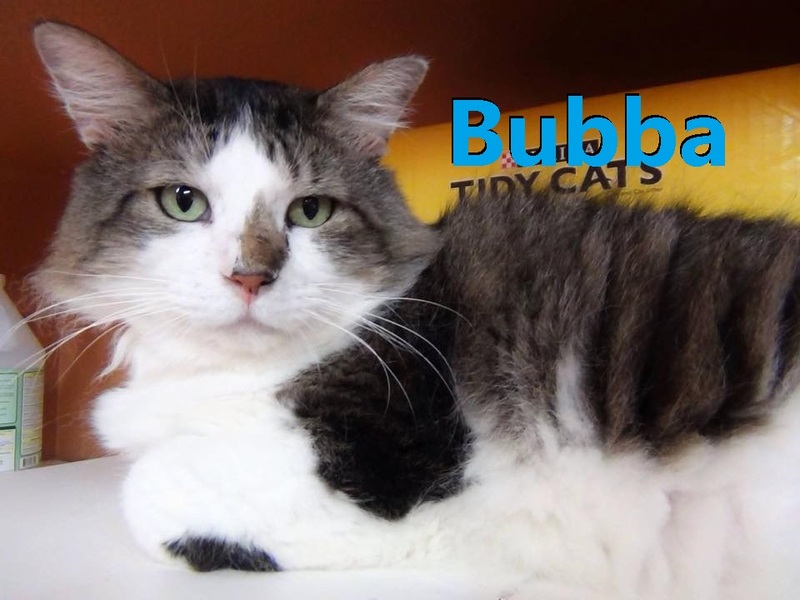 By sponsoring one of our FIV cats you will be providing food, medical care, and their basic care and support. 100% of the sponsorship goes to the care of these animals. None of the Yogie volunteer staff receives ANY compensation for the work we do. 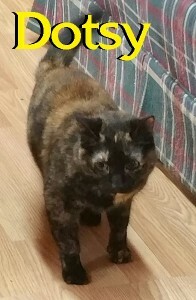 Dotsy is a 10 year old FIV positive Tortishell cat. She was an owner surrender to the Caddo Parish Animal Control. Dotsy is very sweet, gentle, and loving. She is spayed. She has no problem spending time in your lap if you have the time to provide it. 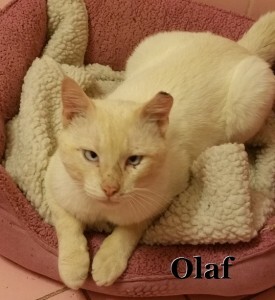 Olaf is a beautiful, white male with flame tips and blue eyes much like a Siamese cat. Olaf was a feral cat who was injured and nursed back to health. He had an injured leg when we took him in and during his X-Rays a bullet, not the cause of the current injury, was seen in another part of his leg. During that healing time he proved to be a most loving, playful, and happy boy. 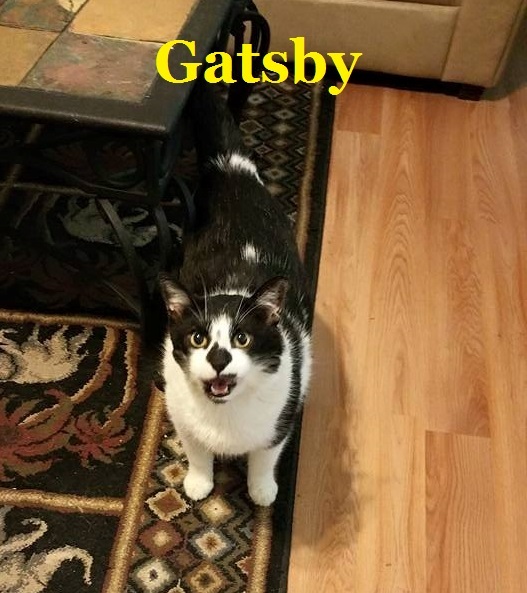 Gatsby is tuxedo that survived a pit bull attack that a sweet lady rescued. He is FIV positive. He is a temperamental boy in that he loves attention, but is unpredictable and will bite. As a result we have not made him available for adoption. Several of us have had some pretty good bites by him, but we still love this sweet boy and he will be safe with us for the rest of his life. Voodoo is the other cat who arrived from the vet with Paisley and Sunny. Voodoo is a black, longhaired cat. He has one ear that stays down much like a Scottish fold cat, but there is nothing wrong with it. We find it endearing. 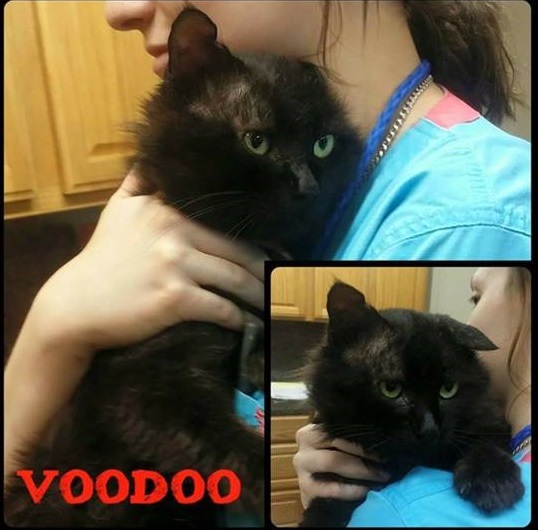 Voodoo is both FIV and FeLV positive, but he doesn’t show any signs of illness. He loves to play and hide in the kitty tube. 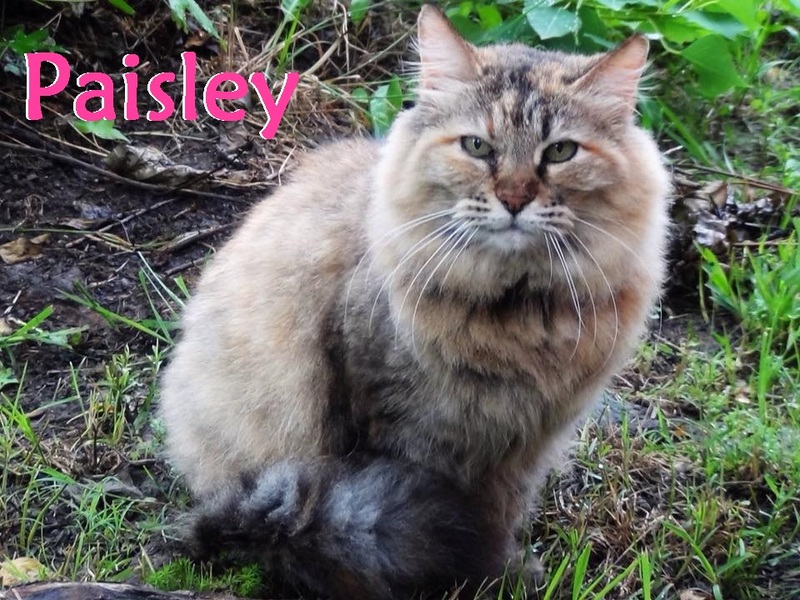 Paisley is a beautiful, long haired, calico cat who arrived with Sunny and Voodoo from a local vet. Paisley is FIV positive and sounds like she has a cold, but she doesn’t. She is very healthy and a playful girl. She spent time with our director in foster with Sunny. Sunny – don’t you love that face?? 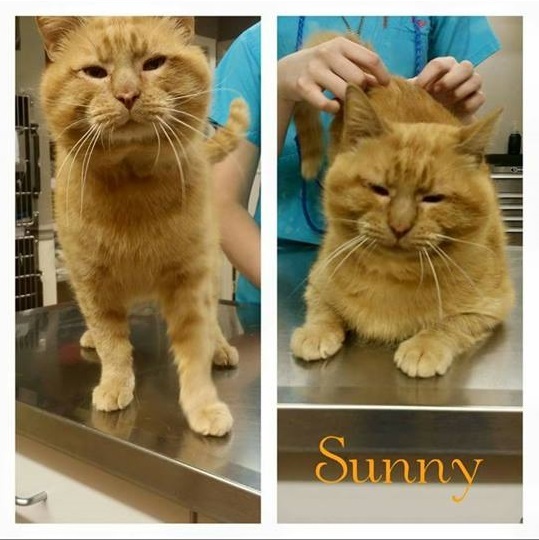 Sunny is a gorgeous ginger cat that arrived with two other cats that a local vet asked us to rescue. He is FIV positive and also suffers from an eye condition called, Spastic Entropion, and this causes him to have runny eyes that we have to keep clean. Sometimes he needs meds for his eyes, but the condition is under control. Sunny has one of the most amazing personalities and is extremely playful. He and one of his companions spent a month in foster with our director while undergoing treatment and he did amazing. He will need eye care for the rest of his life, but it doesn’t always flare up and is manageable. Frazier is a “Russian Blue” cat. We say that because it is easier to describe his color as one, but don’t know if he is a true blue. He is FIV positive and the couple that asked us to take him after they were told by a very uniformed individual to euthanize him. We were happy to take him and he is a fun and sweet boy. The Boss is always watching. Bubba is also a long haired white and gray cat, FIV positive, who loves attention. When he arrived his ears were badly damaged from street fighting with other cats and we were told his fur would never grow back, but it has and you would never know there was any problem. He loves sleeping in your lap. King is a very large, approximately 5 year old, FIV positive, gray tabby. He is neutered. King is an extremely sweet and loveable cat who was owner surrendered to the Caddo Parish Animal Control. 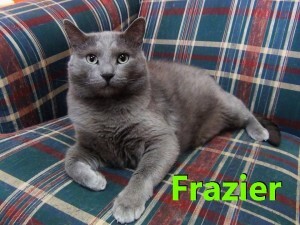 The owner said he had been fighting with their other cat and they were worried about his FIV status. King has not had any issues with our current residents. He is a big old lap kitty. 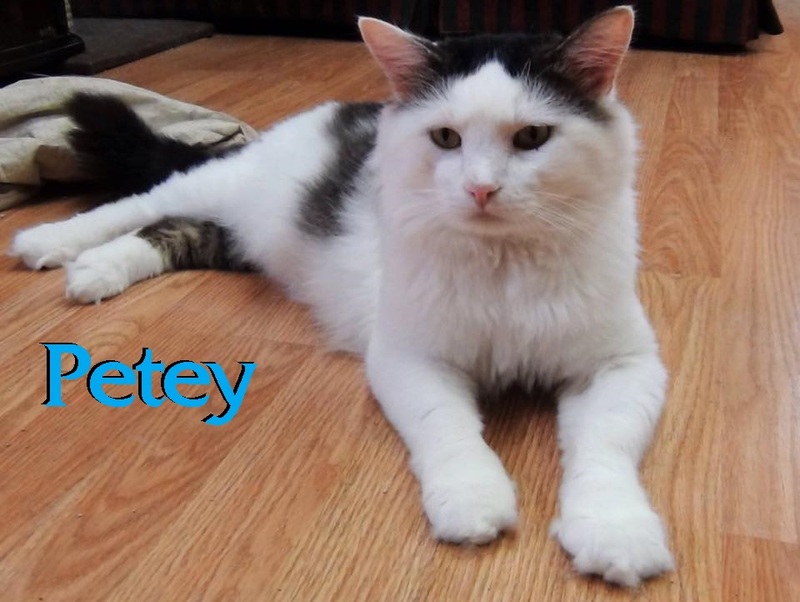 Petey is a long haired white and gray cat, FIV positive, who was an hour away from being euthanized just because he was FIV positive. One of our volunteers asked if we could rescue him and we did. Petey is an amazingly sweet and affectionate cat. He is a very sweet boy and hope someone adopts this love bug. We want people to know that FIV is not a death sentence and you shouldn’t be afraid to love one or more of these beautiful cats.